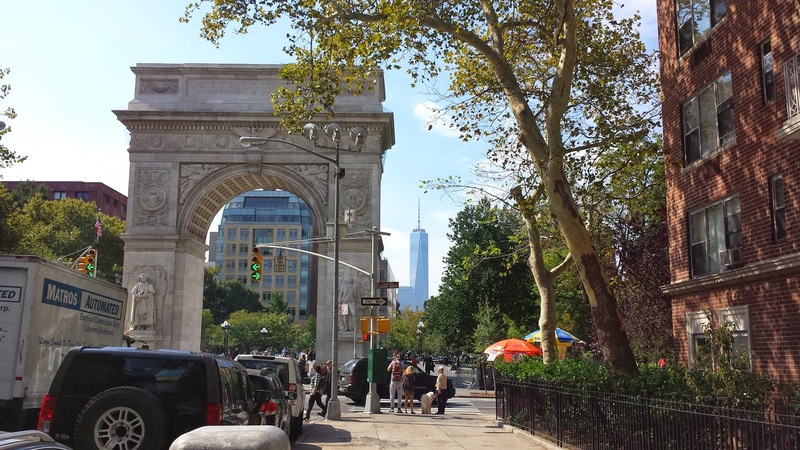 September 23rd, 2014: Where am I now and what is going on? Update post rest week. I returned at the same time Brian got back from his appointment. We made quick work of the remaining tasks. All was fixed on my unit and I learned a ton about the simple device. After I picked up a few extra things - sleeping mask and a few internal filters - I was ready to push off and head home. My trip up lasted 4 hours; the trip back was about 4.5 hours. Again, not bad for an east coast trip up I-95. I arrived home in time for dinner with my family. Needless to say, I was dead tired. Bedtime could not come soon enough. 2. Giving a Presentation on Wednesday night. Two days before my trip to Hypoxico, I gave a brief presentation to a client gathering hosted by my friend's company. Here are the slides for those interested. The event was a ton of fun. I met some very interesting people and had a chance to tell part of my preparation story for Everest 2014. Even though my climb was not successful, I still believe I prepared well and controlled what I could control. Thanks to Glenn Mickelson for inviting me. 3. Organizing my training schedule on Monday. My huge spreadsheet needed some updating. Previously, I scheduled summit days to fall on Sundays but as previously mentioned, I found it far easier to have a long, hard day on Saturday. That change required a ton of updates on the Google doc. I spent a few hours updating that sheet on Monday before my meetings and Google Hangouts with students. 4. 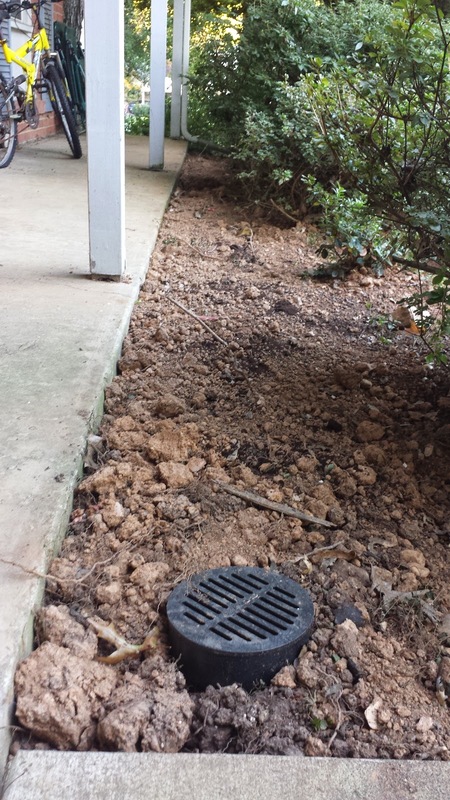 Digging a ditch (queue the Dave Matthews song). Very purdy, ain't it? These are essential for my planned climb up the Polish glacier on Aconcagua. 5. Working. Oh yeah, I work too. My students rock! We meet each week for an hour (Thursdays from noon to 1pm - called the MRES (pronounced mysteries) meetings) and I also meet each of my students for an hour either in person or via Google hangout. I believe we have 7 papers ready for submission in the next few weeks. It should be a productive semester. My lab also has a grant currently funded and several in preparation. Our support from the Office of Naval Research (ONR) enables us to delve into many different topics. Right now, we focus our attention on simulated training - go figure. The grant funding allowed me to "buy out" of one course so this semester is a relatively light teaching load. For the first time in a while, I am teaching an undergraduate class. I find it quite refreshing from my usual routine. The undergrads are really enthusiastic and keep me energized from class to class. It is early in the semester when we are all fairly excited. Expect routine updates on how my training and teaching affect my disposition; I expect smooth sailing. See you next week when I preview my 12 week run before departing for Argentina. Week 1 (this week) is only 18 hours and I progress to 27 hours in 12 weeks. Should be a fun ride; hope you enjoy the trip with me. 1. Rest. The one huge advantage of having a clear, proven plan for training is that I have several times I really look forward to during the process. I increase my workload in 3-week increments. Each week progresses by 10% from the previous week but stops every 3 weeks to drop down by 10% back to the middle week level. Thus, the load progression looks like a sawtooth shape that increases over 15 weeks. The past 15 weeks had 5, 3-week cycles where the plan was to progress from 10 hours up to 30 hours using this method. I really look forward to week 16 when I completely shut down, rest, sleep at normoxia, and eat to my heart's (perhaps more my brain's) delight. Even after each 3-week cycle, I look forward to dropping back to a lower workload. Increasing the workload in this systematic fashion keeps me fresh and excited about more training. Gotta keep it fun but sprinkle in plenty of rest. 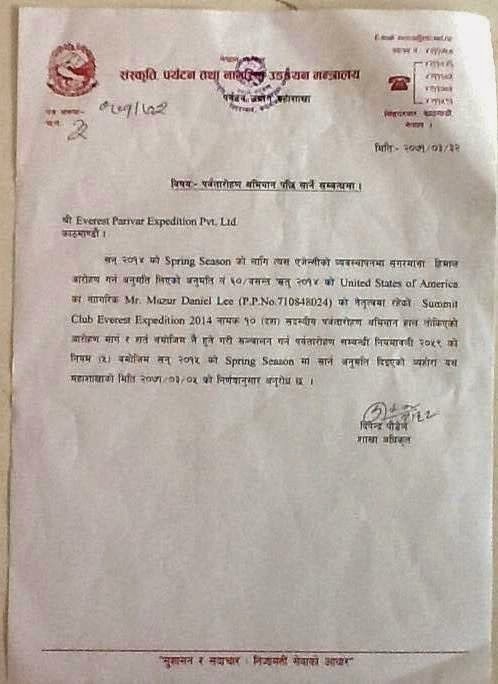 As per your agency requested letter, This is to inform you on dated 2071 – 03 - 05 that SummitClimb Everest Expedition 2014, permit no 60/Spring, led by Mr. Mazur Daniel Lee (P.P. No 710848024), including 10 climbing members permit is extended to next spring season 2015 as per law 2059 – sub law – 5. 3. Aconcagua plans shaping up. We have four confirmed climbers for our trip to Argentina in December. I leave on December 6th, my family leaves on the 17th, and Brendan Madden joins us on the 20th. I hope to have three climbs on Aconcagua or other peaks in the area before I depart on January 12th. Should be a great time. Flights booked, equipment checked, and details sorted out; next step, plan for food and domestic travel. I'm practically jumping out of my chair with excitement. 4. Hypoxico Tour. Speaking of jumping out of my seat, I'm heading up the New York City - my home town - to get one of my units checked out. It was making some strange noises so Brian Oestrike suggested I get it checked out. No better time than the present (Friday actually) where my week-off gives me the ultimate luxury to make the 4-hour drive from Fairfax to NYC without missing a workout or any meetings. I intend to take in a few conference calls during the drive up (from 4am-8:30am) and then a few on the way back (from 7pm-11pm). The folks at Hypoxico were extremely inviting and even offered me the use of one of their machines/setups to workout. I told them that this week was devoted to rest (#1 above) and I planned to just walk around the city and get some good food. Remember, this week I focus on eating too - no better place to eat than NYC. Pizza joints...here I come! With any luck, I roll out of the city after a few hearty meals and about 10 lbs of additional heft. Wish me luck on Friday. Speaking of Hypoxico, Sam & Alex as well as Brendan both ordered units. Should be fun comparing notes as we all prepare for some big climbs ahead. 5. Early to bed and early to rise makes me tired. Apologies to Ben Franklin but healthy, wealthy and wise do not match my experience. My son returned to his morning schedule. He has swim practice from 4:30am to 6:30am on the weekdays so Kathy and I take turns shuttling him the 20 minutes to/from practice. I think I found my groove where getting up at 4am is far better than stirring at 4 and then waking at 6am. Often, I return from dropping him off and drift back to sleep - no matter what I am doing. Even if I go to sleep at 8pm I still wake up exhausted when I change the routine. My current sleep/wake cycle might take a while to absorb into my system but I assure you it will work. Soon, I plan to get in a few extra workouts from 4:45am (when I return) to 9am when I typically head to campus. Nothing like a good 4-hour workout to start the day. Good thing I have a couch in my office for that inevitable mid-day nap. 6. Summit Saturdays. I changed my training routine a bit to accommodate the rest of my week's schedule. Sundays worked for me last time when I was training for Everest 2014; those days do not work any longer for Everest 2015. I found that Sundays really needed to be easier or else I risked getting sick and not recovering sufficiently for the next week. Wednesdays came too soon after Sunday and I often found Fridays to be less useful training days. So, after careful consideration and several trials, I found that Saturday was the perfect day to simulate my climbs. The past 7 weeks had some intense simulated climbs where I would try to mimic a climb - approach, summit, and descent. These days started out rather easy and slowly progressed to two peak summits and almost 10 hours of hypoxic training. I felt and feel great during and afterwards. It might be a little early to get too acclimatized to high altitude but I figured this time was an excellent opportunity for me to test out different routines. Success! I tested out a new routine and now my week is much more manageable. September 8th, 2014 - a 2 month hiatus from posting but back and better than ever! I hope this update finds you all well. My summer was extremely busy with training, parenting, building, resting, relaxing, sailing, and other non-G-rated gerunds. The funny thing about blogging is that when I got behind, it became harder and harder for me to post - something akin to returning a borrowed item. Starting back up seemed hard but it really isn't. So, here I go with my first blog post of the fall and I expect more to follow. These posts document my training/preparation for my climbs this 2014-2015 season. There are a few people I need to acknowledge before I post any updates. Dad's inspiration. I had a great conversation with my dad the other day. He told me to get back to posting updates so that the posts drive me to be better. I get it. Sitting here working my life away and mulling things over in my head from last year provide nothing but reasons to continue a reclusive lifestyle. I have a great life and a great family. Many of you do not know but my dad battles pancreatic cancer. He may cringe by this note but I want to draw out the positive. My dad inspires me. He pushes through awful treatments delivered by the best in the world. I gather my strength from his endurance. When he told me to press forward with a simple task of posting updates, I did so without hesitation. We all encounter obstacles in life but few are as daunting as what my dad endures. Life is great and we all ought to make the most of what we have today. BE HERE TODAY. Thanks dad for reminding me of what matters. I'm back. Brotherly support. My brother worries and often calls to check in. He worries about his younger brother and I appreciate his concern; I love him like no other. There are few people in life who can provide the support only a brother can provide. I am fortunate that I have three brothers - Sean, Ed, and Kevin - the latter two cousins or brothers of another mother (and father). My cousins also serve in that role. They never waver in their support. Thanks guys. I climb for you and all those who cannot climb due to limitations. Someday we will jump out of a helicopter with our sons and ski untracked powder until we drop. Expect it and plan for it. Kathy - a wife like no other. Some of you may recall that Kathy sleeps in the tent with me. Her support never stops. She trains for triathlons and she toils with her own goals. We rejoice about successes and mourn (briefly) our defeats. The past year was a huge test for both of us. We both had successes and failures. Without her unwavering support, I would never realize any of my goals. Just ask my students; they all know my adoration. She makes me better and pushes me to strive to be better still. I love you so and have no reservations to express it publicly. The best son a dad could imagine. I promise I won't embarrass him. A 14-year old is easily embarrassed by his dad - especially publicly. My son makes parenting easy. He is a devoted athlete, good person, and easy-going lad. I can't wait to climb in Argentina with him...and Kathy. Life is good! Thank you all. I hope to share all the fun from the next few years with you. The other night, Kathy and I finalized our plans to Argentina. I fly out in early December and Kathy and Patrick follow in mid-December. My blood is flowing again and I can't wait to get back on a hill. My friend Brendan Madden - who lives in Japan - booked his trip so he plans to join us. Next, we need to convince Sam to come out from the UK (or Africa where he is now). I intend to post my climbing plans shortly once I have all the itineraries solidified. My current thinking is to get down there early, climb a technical route (perhaps the Polish direct) and then come down to retrieve my family and Brendan. Together, we will climb the normal route up and summit. It should be a fun time with plenty of climbing, steak eating and Malbec drinking. As I indicated upon my return from Nepal, I plan to return in 2015. Some signs indicate that the Nepali government will honor our permits. I remain somewhat skeptical but guardedly optimistic that they will spare me the $10,000 expense. Now, about the oxygen....more on that later. I have one week left before I get a full week off. The past 15 weeks were a slow, base-building progression where I accrued over 265 hours of training - mostly at normoxia. I completed 5 simulated climbs up to the equivalent of 19,000 feet. In sum, I've been busy training, getting my lab back in order, and finishing some tasks on the house. Not much sailing to speak of this year but I hope to get out every now and then with my friend Bob and our crew of swimmers. I intend to post a bit more about some of my new training ideas. Like my Everest plans....more on training later. So there you have it. Fifteen weeks down in preparation for two climbs. I have tons more to post about the climbs and our revised plans for Everest - that is, once I figure out what we are doing and what expenses I can expect. Stay tuned for more.